Meow Wolf is a Santa Fe-based arts and entertainment collective that creates immersive, interactive art experiences to transport people of all ages, backgrounds and tastes into fantastic realms of story and exploration. Meow Wolf is a Santa Fe-based arts and entertainment collective that creates immersive, interactive art experiences to transport people of all ages, backgrounds and tastes into fantastic realms of story and exploration. Meow Wolf was started 10 years ago by a group of twenty-somethings who were seeking venues to create, display and perform their art. The art collective now operates a multimillion dollar, multi-faceted enterprise that employs more than 300 people, mostly artists. "It's obvious that the art collective best represents the 'Land of Enchantment,'" said nominator Ellen R. Kemper, a Santa Fe attorney. Meow Wolf opened its multi-dimensional House of Eternal Return permanent exhibit in March 2016. Meow Wolf Co-founder and Chief Executive Officer Vince Kadlubek describes the mystery house, with its secret portals to magical worlds, as "immersive storytelling." In the past two years, Meow Wolf has donated about $500,000 in grants, sponsorships, art donations, reduced admissions and free tickets. "Our ethic is simple," Kadlubek said. "The more people who visit us, the more we channel that support into philanthropy in Santa Fe and New Mexico and beyond." The Santa Fe Chamber of Commerce named Meow Wolf Small Business of the Year in June 2016. Tania Armenta, President and CEO of Visit Albuquerque, said "Meow Wolf is not only a Santa Fe gem, it's a New Mexico gem." Meow Wolf's success elevates New Mexico's "diverse and talented arts community along with our innovation," Armenta said. In addition to attracting visitors from all over, Meow Wolf "has breathed new and exciting creativity into Santa Fe's world-renowned art scene, said Tim Harman, president of the Santa Fe Gallery Association. "It has provided our community - locally and statewide - with an entirely unique way to view art. I believe there is nowhere else where art is as immersive, tactile, and participatory as The House of Eternal Return." Meow Wolf demonstrates that "young artists with a kernel of an idea can create something entirely new that is sustainable, economically successful and boundary-blurring," Harman said. 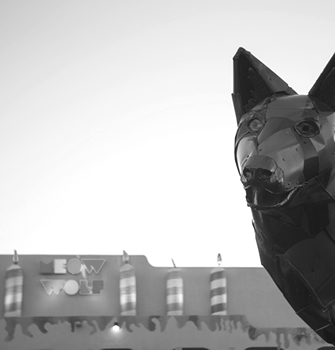 "By utilizing technology, interactivity, and virtual reality to complement and enhance traditional artistic media, Meow Wolf is at the forefront of redefining the very idea of art." Meow Wolf's commitment to "radical inclusivity" is especially noteworthy, Harmon said. "Art can be polarizing and exclusionary. But it also can raze metaphorical walls. A visit to The House of Eternal Return will illustrate the collective's success in bringing young and old, rich and poor, and all races, together in one space to revel." Santa Fe Mayor Alan Webber and former Mayor Javier Gonzales said in a joint statement that in the last several years no organization has made a larger impact on the arts, culture or economy in Santa Fe or New Mexico "than the artists and dreamers who make up Meow Wolf." Meow Wolf's presence in a re-purposed bowling alley in midtown Santa Fe has positively impacted the entire area, helping initiate growth in housing, entertainment, restaurants and nightlife. "It's not just that a local startup has found success that is important," the mayors said. "It's that the founders and visionaries behind it are homegrown, New Mexico products - living evidence that communities who invest in creativity and expose young people to the arts are planting seeds that will grow to have a lasting and powerful impact." Meow Wolf's recent expansion into Denver and Las Vegas also boosts awareness of Santa Fe and increases its profile within the region. "To honor them with the Governor's Award for Excellence in the Arts will send a message to every innovator, dreamer, entrepreneur, founder and artist - at home and across the country; a message that says, 'In New Mexico you can take your chance, build your dream, and you will find a community and a culture that supports you and will be here to help you succeed,'" Webber and Gonzales said.